Whether you’re buying your first car or trading in for a top-of-the-line vehicle, Mazda has come up with a 2015 Mazda3 line-up that’s sure to meet your needs. The base SV model is a solid offering, and the features and options keep getting better as you move up through the trim levels. We’ve put together a quick overview of the 2015 Mazda3?s specs to help you choose the trim level that works best for you. Whether you start with the base i SV model or opt for the i Sport trim, Mazda provides these introductory models with the power and handling drivers expect. With a standard SKYACTIV-G 2.0L 4-cylinder engine, the 2015 Mazda3’s specs of 155 hp and 150 lb-ft of torque ensure you’ll be going from zero to 60 in about 8 seconds, while maintaining 30 mpg in the city and 41 mpg on the highway (on automatic transmission models). In the i SV, you have access to full power accessories, remote keyless entry, a trip computer, and a four-speaker stereo with iPod/USB compatibility and auxiliary audio input. With the i Sport, you receive all of the i SV features plus cruise control, Bluetooth phone and audio, a 7-inch touchscreen display (with unique knob-based controller), an upgraded six-speaker stereo system, smartphone enabled internet radio, and more. As you move up to the higher trim levels, performance stays the same with the standard SKYACTIV-G 2.0L 4-cylinder engine and competitive fuel economy ratings. What you’ll see when opting for the 2015 Mazda3i Touring (MSRP of $19,595) and i Grand Touring (MSRP of $22,745) trim levels is that both interior and exterior details are more upscale. The more polished exterior of these Mazda3 trims features upgrades that include alloy wheels, bright beltline trim, and side mirrors that match the body color and have integrated turn signals. These trim levels also feature upscale luxury interiors. The i Touring comes standard with premium cloth-trimmed sport seats and a leather-wrapped steering wheel. In the i Grand Touring, the power sliding-glass moonroof, dual-zone automatic climate control, and heated leather seats with lumbar adjustment make for an even fancier ride. The i Grand Touring adds on leatherette upholstery, heated front seating, a six-way power-adjustable driver’s seat with lumbar, and a nine-speaker Bose surround-sound stereo system. In addition to these more luxury-focused amenities, both the i Touring and i Grand Touring add safety technology like blind spot monitoring, a rear cross traffic alert system, and a standard rearview camera. Differences include: The s Touring retains most of the i Touring trim level’s features, but Mazda adds steering wheel-mounted paddle shifters, 18-inch aluminum-alloy wheels, and that heads-up display. 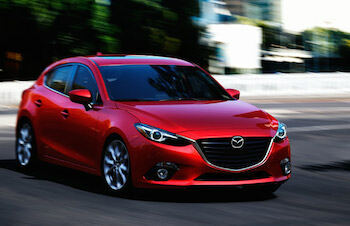 The 2015 Mazda3s Touring is priced at $23,845 (MSRP). With the s Grand Touring, drivers really have it all: bi-xenon headlights, leather upholstery, an auto-dimming rearview mirror, and available upgrades that include forward collision warning and crash mitigation systems. The 2015 Mazda3s Grand Touring MSRP is $25,045. Each of the 2015 Mazda3 trims offers a powerful and fun-to-drive car with one of the best fuel economies in its class thanks to Mazda’s SKYACTIV technology. Your choice of trim level depends on your budget and overall preferences. Consider going for the s Touring or s Grand Touring if you’re looking for advanced safety features and an upscale ride. Drivers looking for essential convenience features and great fuel economy for a low price will be more than happy with the popular i SV and i Sport models. And the i Touring and i Grand Touring offer you a nice middle ground between high-class and easily affordable. Which of the 2015 Mazda3 trims is the right one for our Schaumburg drivers? We want to help you find out; contact Biggers Mazda or visit our showroom in Elgin to take a test drive of the new Mazda3. We look forward to showing you everything else it can do!